To appreciate why our dental gel is a breakthrough in oral care, it helps to understand first why toothpaste is largely ineffective at cleaning teeth. Toothpaste cleans teeth by scrubbing teeth with abrasives and detergents. These ingredients are only marginally effective. It is actually the toothbrush doing most of the work. In addition, when you use a toothbrush to scrub your teeth, it is nearly impossible to clean in hard-to-reach areas (e.g, near the gums, in-between teeth, and in the nooks and crannies). Our dental gel is a breakthrough in oral care because it cleans your teeth in several innovative ways. Brushing with our dental gel provides a level of cleanliness that feels close to a professional cleaning. Our dental gel was developed over 12 years in close collaboration with two major U.S. universities. 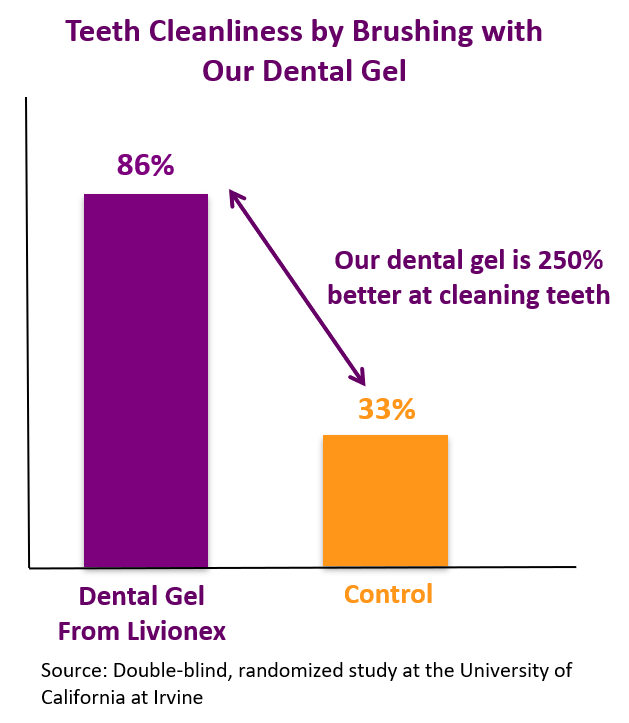 Double blind academic studies show that our dental gel cleans teeth 250% better. It is no wonder that our dental gel has been called a major oral care breakthrough.